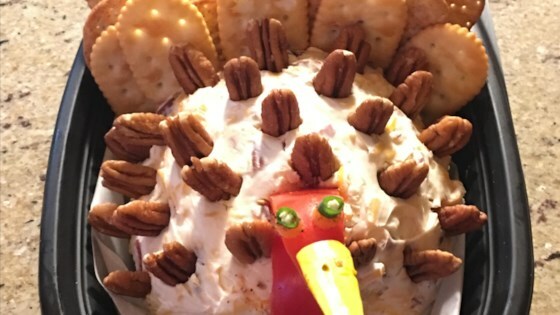 "Any cheese ball recipe can be turned into the shape of a turkey for a festive appetizer for your Thanksgiving dinner. All you need is some creativity!" Mix cream cheese, Cheddar cheese, and dressing mix together in a large bowl. Form into a large ball. Roll in chopped pecans to coat surface. Refrigerate for at least 2 hours, or overnight. Arrange a row of whole-wheat crackers in the back of the cheese ball for the turkey tail feathers. Stick pecans evenly into the cheese ball for the body. Cut out 2 strips of red bell pepper for the head and neck. Cut out 2 "eyes" from the black olive using a small pastry tip. Place 2 small dollops of cream cheese on one of the 2 bell pepper strips for the turkey head and stick the black olive circles into it as pupils. Cut a small triangular slice out of the yellow zucchini for the turkey beak and stick to the red pepper with cream cheese. Stick the undecorated red bell pepper strip on the front of the cheese ball. Stick the red bell pepper stick with the face into the top of the cheese ball for the head. You can make this recipe ahead of time. Assemble the turkey with the pecan "feathers" and store in the refrigerator, loosely wrapped in plastic. Add cracker tail feathers and the turkey head and neck just before serving. This was really fun, and I am not even remotely good at crafty things. I have made this... I am a fan of cheese balls and this was fun to make.. took a bit but fun.. As for flavor it was good not as good a a crab cheese ball. My company very much enjoyed it..
Love the recipe but added dried cranberries and apricot with honey and did not use the ranch mix. Very flavorful and easy to make!